I walked my dog in a new area yesterday, and enjoyed exploring a few cul-de-sacs that I had never seen before. At the end of my walk, I passed by this charming home and snapped a quick picture with my iphone (hence, the less than average quality of the picture). In a city filled with large homes, more and more I appreciate the charm and appeal of a house that is just the right size - not too big, not too small. This house really appeals to me, not only because of the French styling, but also because of the scale and proportions of the home. The paved (or pea gravel, I can't quite tell) area in front of the house, the French doors, the sculpted trees in planters, all contribute to the charming French feel of the house. Although I am usually not a fan of mansard roofs (where the upper slope is steeper than the lower slope), it is perfect in this particular house. Mansard roofs are very French in style, and traditionally allowed for usable living space on the second floor of a one story home. Although this house appears to be fairly small, it is actually about 5,800 square feet. I love homes that look small on the outside, but are actually quite spacious on the inside; this is a real testament to the skill of the architect who designed the home. To see more French style homes in Atlanta, click here and click here for French style homes from around the world. I would move in, in a second!! The landscaping only adds to it, don't you think? beautiful! I would love to see the interiors somehow -i wonder who the architect was? I love walking my dogs. It give me the opportunity to peek around the neighborhood and give all the houses a good luck. What an amazing home you live near. So pretty. Congrats on yesterday's mention in the Washington Post! love it! when can I move in? that is the exact style home I want! I'm not a big mansard fan either except when it works. I'm with Arch-Design, I love gravel up to the facade. That makes the trees in the boxes architectural. Those trellises will be amazing when they green up. I like how the mass is broken up so it it seems human sized. And there is no stair climb up to the front door. I'd feel perfectly comfortable walking right up. This is high style but not intimidating. I am with High Heel! Nothing like having a dog to walk to see the details of a neighbourhood, and to not arouse suspicion. I too would like to see the interiors...the exterior has beautiful curbside appeal! Love the courtyard style drive. Very nice. I too think part of the charm is the simplicity of the landscaping, the repeat of the topiaries. It lets the home stand out on its own...lovely! It is lovely, I bet it is just as nice inside! Don't you love walking because it gives you the chance to make discoveries like this! Very Nice! The landscaping. It does the trick for me. I love this front facade. Love the trees that are potted. Charming. And it sits so nicely on the lot. Wouldn't the world be a lovely place if all homes were designed as beautifully as this one. I find it as charming as you do. Congratulations on your mention in the Washington Post yesterday! Gorgeous home - and you are right the illusion that the home is less large than it is gives an intimacy and friendliness to the property. Have a happy weekend, xv. Yes, I agree, walking my dog us a great way to get to see houses without arousing suspicion! It has opened up a whole new world for me. I never would have seen this house by driving around. I also agree that the landscape and hardscape really differentiates this house. And, I forgot to mention one feauture that really caught my eye - the home has a green front door! I love green front doors. Well your just going to have to get a better picture of the door so we can see the green. The more I look; the more I like it and see details. I like that the door is recessed just a bit, to keep guests out of the rain. I like the smallish elliptical fan light with diamond shaped panes. It brings even more attention to the door but is subtle. The dormers are inset a bit so they don't line up with the 1st floor windows. They kind of "pyramid in" as the roof does. The coins and the rustication around the door don't shout but they are "there" to find and tie the corners to the door. There is a lot of serious, high quality design stuff going on. It's a house that's easy to take-in on first glance, and rewards looking for details. I'll bet the inside does the same. That is my dream home (lol) I wonder when can I move in. Beautiful! Isn't it fun to be a real estate spy and get ideas as you walk around the neighborhood? It seems that your dog-walking takes you past some very interesting places! Like how the trees embrace the house, charming indeed. i'd love to move in any minute! I know this house, it was designed I believe (cant find my book ) by James Means. I ve even been inside and its fantastic. 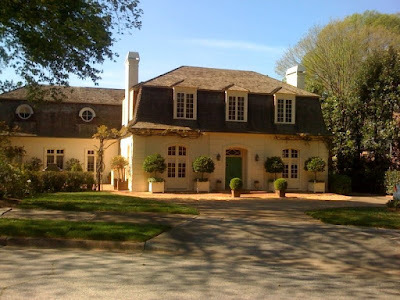 He did a great many french style houses in Atlanta/ Buckhead and they all look great! He is one of your local treasures. The original house had a sort of carport to the left designed to look like an open air country shed. There is charming small courtyard garden in the rear and the floor plan is all about one large central room. It was published some where years ago. When I showed a picture of this house to an architect friend, he immediately commented that it looked like a Jimmy Means house. After reading your comment, I flipped through the James Means book at the local book store, and although I did not see this particular house, I saw some stunning examples of his work throughout town - some of which I had seen (and did not know they were his), and some of which I had not seen. He was an amazing architect, and to think that he was not formally trained is amazing! I did not, however, see this particular house, but it certainly has all of the hallmarks of the Means style. I wish someone could tell us which magazine it was published in! I can see a horse-drawn carriage driving up to the front of the house :-) It's beautiful & charming, and so different from the houses that are typical in my neighbourhood. I really like the little round windows and the big trees in the pots. They look like topiaries on steroids!! my house is the reverse, it looks big, but it is not. love the planters which add to the french factor. I found my book, you are totally right and I am wrong whoops! Maybe it's new... hard to tell from a picture. Anon, I did not even realize there was a James Means book until reading your comment, and I just ordered it from Amazon - so thank you for your comment! Another reader emailed me and asked if this was the James Means house that is on Wyngate, and that house was published in 2001. The tax records for the house say that it was built in 1989, yet the other houses in the cul-de-sac were built late 60s/very early 70s (prime James Means time). I suspect this house was built in the late 60s, then renovated in the late 80s. Do I dare to put a note in the mail box and ask? I might! Please do ask who did it. Hey I really like your blog…! I am regular visitor of your blog..